I would like to suggest somewhere in setting dialogue, allowing users to specifying filenames for the output instead of .EMB filename. Reason: One design, but requires different variations, and would like to keep all variations on the machine. For example: Say, for the same logo, I want to have some colour changes for black and white shirts. Instead of creating two .EMB files, I can use a single .EMB file, specify colours for black shirt, send to WiFi USB and call it logo on black.pes; then change colours for white shirt, and this time call it logo on white.pes. 3 months 8 hours ago	#1294 by Pascale R.
Yes, good idea ... but with option to have this feature 'inactive' unless you know you want to change names. Otherwise the speed of using the machine connection icon would be slowed down by extra step of dialogue box opening & having to close it. For example, if you want to rename, then right click on the machine icon to access the dialogue box for the Connection Settings. If you don't need to rename file, simply click machine icon to send to machine as usual. Pascale R. wrote: Yes, good idea ... but with option to have this feature 'inactive' unless you know you want to change names. Otherwise the speed of using the machine connection icon would be slowed down by extra step of dialogue box opening & having to close it. Agreed and certainly don't want any extra unnecessary step. However, there are times I can see the benefit of having the option (to specify filename). 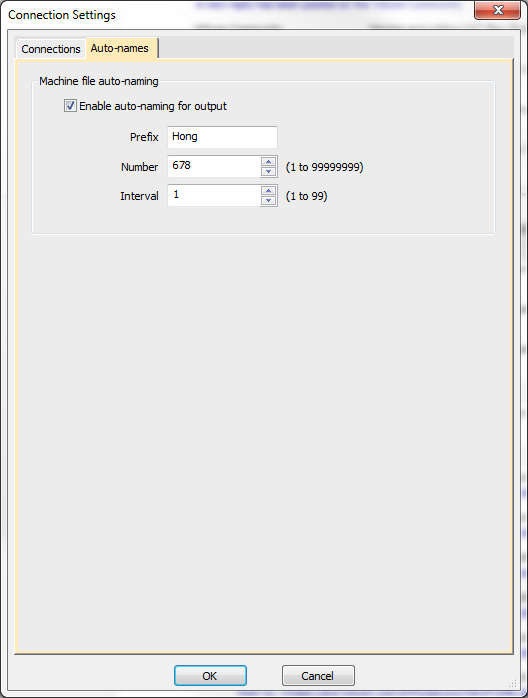 Perhaps, the output dialogue can have the default filename as the filename of .EMB, and if filename does not require changing, just press Enter key. Have you tried to use the machine file auto-naming feature in the Connection Settings dialog, which allows you to specify machine file names. 2 months 4 weeks ago	- 2 months 4 weeks ago	#1336 by Pascale R.
That is interesting Hong. No, I had not paid attention to that tab before, I will give it some thought. The auto naming with prefix & sequential numbers would work for Antony's scenario, but I imagine it might be difficult to determine which file to choose at the machine based on the nomenclature. What are other examples of how people are using the auto-naming with prefix feature? Additional observation: The auto-name Prefix has 8 characters, so one could name each file as you send it provided 8 characters is enough. Like Pascale mentioned, the auto-naming is actually auto-sequencing in other words which is not what I need. And users will need to change settings (prefix) for each different design. I would like the ability to use one of those Connection Manger buttons, while having the ability to specify meaningful filename. - Prefix: ASCII only, no unicode characters. No Windows reserved characters. - Filename length limit: 8 characters. We have already have some internal issues raised for the current implementation. If you have more thoughts to improve the auto-naming feature, please let us know. 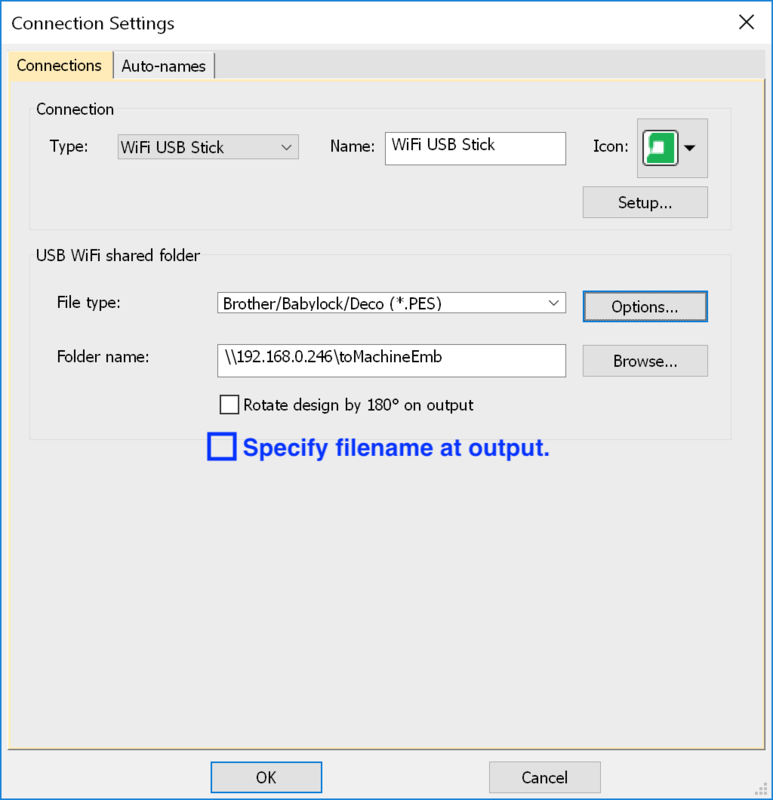 So you would like to disable the auto-naming feature and be able to enter a meaningful output machine filename before a design is sent to a machine, which is setup via the Connection Manager? Thanks Antony for your reply. I have raised an issue for your request.